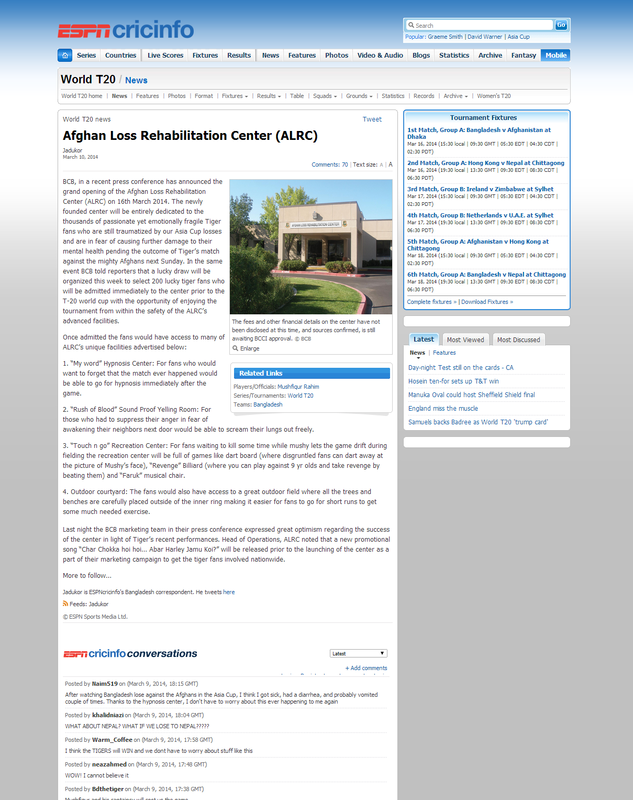 BCB, in a recent press conference has announced the grand opening of the Afghan Loss Rehabilitation Center (ALRC) on 16th March 2014. 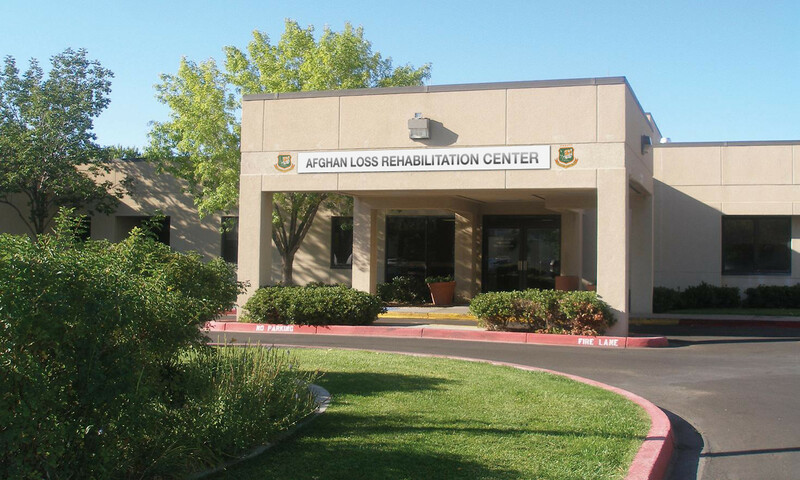 The newly founded center will be entirely dedicated to the thousands of passionate yet emotionally fragile Tiger fans who are still traumatized by our Asia Cup losses and are in fear of causing further damage to their mental health pending the outcome of Tiger’s match against the mighty Afghans next Sunday. In the same event BCB told reporters that a lucky draw will be organized this week to select 200 lucky tiger fans who will be admitted immediately to the center prior to the T-20 world cup with the opportunity of enjoying the tournament from within the safety of the ALRC’s advanced facilities. 1. “My word” Hypnosis Center: For fans who would want to forget that the match ever happened would be able to go for hypnosis immediately after the game. 2. “Rush of Blood” Sound Proof Yelling Room: For those who had to suppress their anger in fear of awakening their neighbors next door would be able to scream their lungs out freely. 3. “Touch n go” Recreation Center: For fans waiting to kill some time while mushy lets the game drift during fielding the recreation center will be full of games like dart board (where disgruntled fans can dart away at the picture of Mushy’s face), “Revenge” Billiard (where you can play against 9 yr olds and take revenge by beating them) and “Faruk” musical chair. 4. Outdoor courtyard: The fans would also have access to a great outdoor field where all the trees and benches are carefully placed outside of the inner ring making it easier for fans to go for short runs to get some much needed exercise. 5. “Bowlers back drive” Lecture series: Traumatized Fans who are not fond of exercises could opt to sit in and listen to famous international stars such as Chetan Sharma, Lance Klusner, Misbah Ul Haque on their famous choking experiences resulting in crucial losses. Overseas fans would also be contacted via skype to share their painful experience in losing finals and semi finals of major ICC tournaments. Last night the BCB marketing team in their press conference expressed great optimism regarding the success of the center in light of Tiger’s recent performances. Head of Operations, ALRC noted that a new promotional song “Char Chokka hoi hoi… Abar Harley Jamu Koi?” will be released prior to the launching of the center as a part of their marketing campaign to get the tiger fans involved nationwide. The fees and other financial details on the center have not been disclosed at this time, and sources confirmed, is still awaiting BCCI approval. Should include quotes from either BCB officials or cricket fans. For ex. "After watching Bangladesh lose against the Afghans in the Asia Cup, I think I got sick, had a diarrhea, and probably vomited couple of times. Thanks to the hypnosis center, I don't have to worry about this ever happening to me again," expressed one cricket enthusiast. Jadukar - you know what to do. FP worthy. If you guys wait a couple of minutes, I'm making something you will love. Naim519 you are a genious! loving the pic!!! Naim - we are publishing it as a front page article. May we use your picture (will credit you of course). LOL Thanks! Good work needs to be showcased properly! Yeah. Of course dude. I love satire. Big fan of saturday night live and madtv. Z bhai the picture doesn't show up on my Chrome Browser. I think we should mention Satire somewhere in the intro Z bhai since we don't have a dedicated page for humorous stuff. Nice. Official. Pic isn't showing up, but it's probably an url issue. Register now to avail a special, limited time offer from the ALRC to get a free six-pack of crack-in-a-bottle energy drink from the AUSVI (Ashoka's Umpiring School for the Visually Impaired). Registration is still inclusive of discounts at the CLRC (Canada Loss ...), SLRC (Scotland ...), and NLRC (Netherlands ...). haha, josh lagsey , but why no mention of Banglacricket ? nah, Magicien bhai is great. my favorite is "Touch n go" center, I also recommend a room full of 2nd hand materials where "Rush of blood" fans could throw & break.